TORONTO – How do you coordinate patient care among hundreds of healthcare providers who work independently in communities scattered across a province? Creating an electronic health record system has been VHA Home HealthCare’s response to this challenge – and it is revolutionizing the way the organization’s nurses deliver client care. VHA staff and service providers deliver healthcare and support services in homes, the community and long-term care facilities across Ontario. Its large records management team processes the paper health records produced by more than 800 nursing and rehab service providers. This paper-based system created gaps in care coordination, and limited the organization’s ability to measure quality and promote best practice. The solution – moving to an electronic health record (EHR) – not only offered productivity gains within records management, but also aligned with VHA’s commitment to continuous improvement, client safety, and quality of care through accurate and complete clinical documentation. VHA’s EHR implementation team selected Pixalere as its technology partner, after piloting the company’s wound care management system with a small group of nurses for 10 months. “We have been focused on improving wound care for over 10 years,” says Pixalere’s CEO Ken Hendsbee. Over the course of 18 months, Pixalere developers enhanced the tool to meet VHA’s internal procedures – expanding on the existing features to incorporate VHA’s required forms, including client assessments, medication management forms, pain assessments and physician orders. “The evolution is ongoing, but our implementations have been successful because of our agile collaboration, and continuous review of current and future feature development,” says Hendsbee. VHA reviews Pixalere’s builds while they are being developed, and provides immediate feedback. The resulting EHR features enable VHA nurses to document their full range of client services through photos, free-form text, check boxes, and decision support, to meet the organization’s accreditation and other best practice standards. VHA’s EHR implementation team also leveraged the knowledge of point-of-care staff at all stages of the EHR’s development. “Our nurses have been very involved in the design of the system so its interface is intuitive for them. They were also engaged in the selection of the mobile device – a laptop with detachable touchscreen and built-in SIM card,” says Kartini Mistry, Professional Practice Specialist, Clinical Informatics, whose role on the team is to ensure the EHR design promotes good use, professional practice and quality care for the client. Over the course of the rollout, all VHA nurses received mandatory computer literacy training, an intensive five-hour workshop on the application, and a one-hour online exercise to complete at home. “The at-home exercise gave the nurses an opportunity to practise using the system, and gave us the opportunity to provide feedback where there were shortcomings. We could promote best practice right from the start,” says Mistry. 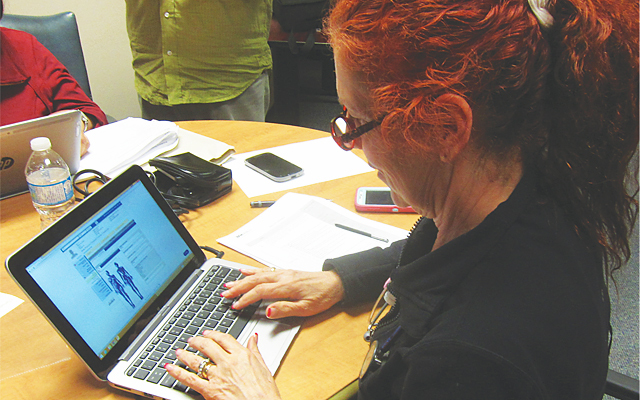 The EHR is now used province-wide with all adult nursing clients. It is used to capture client information in real time, and allows all nurses involved in a client’s circle of care to receive accurate data, make better care decisions, and allocate resources strategically. “It has definitely improved accessibility and consistency of our client data. Things like lost faxes or illegible charts have been eliminated,” says Mistry. Moreover, “The system pre-populates some information from other IT systems, which ensures consistency, and there are mandatory areas for nurses to complete, enabling us to shape clinical practice,” adds Mistry. Having a mobile device with decision-support tools also encourages users to do their documentation right at the point-of-care. This allows VHA supervisors to do live audits and provide immediate real-time feedback on performance.